Effective March 1, 2018, old cardstock Distinguished Veteran Passes and Disabled Discount Passes are no longer valid and will not be accepted at any State Park for associated benefits. 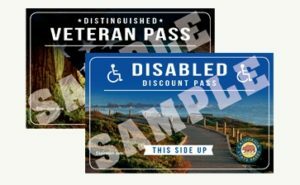 In order to receive the discounts associated with these passes, all individuals are required to reapply with a new application and proof of disability. The new passes are available either by mail, with supporting documentation, or in person at one of State Parks district offices. The closest office to the San Francisco Bay Area is in Petaluma. Go here for a complete listing of offices. If mailed, park’s website says it may take up to 8 weeks. For questions or more information, please contact the Park Pass Sales Office at (800) 777-0369 ext. 2 or (916) 653-8280 or via email at passinfo@parks.ca.gov. Download the application. Neither the park pass nor the application is available in large print or Braille. I have the old Handicap discount pass. I want to go the nearest office to get the new updated one.